Sold by Aspen Estate Agents is this double fronted semi-detached house, built by Runnymede Homes in 2003 and extended around 4 years ago, tucked away in a private cul-de-sac, just a 2-3 minute walk from the village shops. The property offers well laid out accommodation, particularly spacious on the ground floor, with a 20' kitchen/breakfast room, living room, family room and cloakroom. Upstairs is a part-galleried landing, master bedroom with dressing area and en suite shower room, 3 further bedrooms and a family bathroom. There is a gas central heating system to radiators, timber double glazed windows, well-stocked and secluded rear garden and a garage with own driveway for 2 cars. EPC Rating: C.
Wood style floor, radiator, coved ceiling, stairs to the first floor, alarm pad. 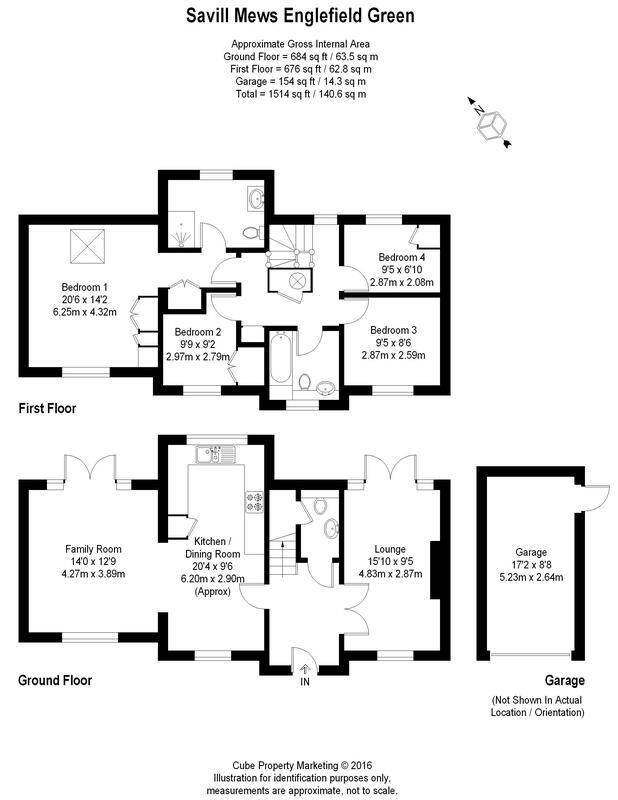 White suite comprising low level w.c. with concealed cistern, pedestal wash hand basin, chrome heated towel rail, frosted window, under-stair storage cupboard. Window to the front and window & French doors overlooking and leading onto the rear garden. There is a TV & telephone point, 2 radiators, coved ceiling and a marble/stone fireplace with inset gas coal effect fire. Filly fitted with range of eye and base level units with attractive tiled wood trimmed work surfaces and ingenious carousel/pull-out larder units. There is an integrated washing machine and dishwasher, built in stainless steel electric oven, hob with extractor hood above and microwave, tiled floor and part tiled walls, coved ceiling, cupboard housing boiler, space for large upright refrigerator/freezer, radiator, telephone point, window to the front and rear. Window to the ront and windows and French doors overlooking and leading onto the rear garden, coved ceiling, 2 radiators, TV, telephone and cable point. Window overlooking the rear garden, coved ceiling, spindled balustrade, built in airing cupboard, access to loft space. White suite comprising large shower enclosure, with chrome shower unit and fixed rainwater head, wall mounte vanity unit with inset wash hand basin, chrome mono bloc tap and pull-out cupboard, low level w.c. chrome heated towel rail, tiled floor and walls, frosted window to the rear, extractor fan. Fitted double wardrobe and display/drawer unit to the side, window to the front, radiator, coved ceiling. Window to the front, radiator, TV point, coved ceiling. Window overlooking the rear garden, radiator, coved ceiling, TV point, fitted wardrobe. White suite comprising tiled panelled bath with mixer tap and hand-held shower and wall mounted Aqualisa shower, folding shower screen, frosted window to the front, low level w.c. with concealed cistern, wash hand basin with cupboard below, tiled floor, part tiled walls, shaver point, coved ceiling, extractor fan, chrome heated towel rail. Extensively laid out to paved patio and shingle with large well-stocked flower/shrubbery beds and fenced boundaries. This is a tranquil area in which to sit out in and relax.